Every organization now days run by a business software, it can be an accounting software, a customer relationship application, or a production management software. The common issues with all these that in some type of level there are operations which required verification from another employee or manager. In most cases the manager who need to give authorization for an operation is not always next to the employee who request it, and here where problems comes when verification happed by the phone, or without too much attention on details. In some other cases there is no verification process at all, and many important operations just re-updated without having the real reason behind it. Since I implemented iVerify system in our organization , all our important verifications tasks are verified very fast, that was a bottle neck problem when it come to my customer satisfaction. The implementation itself was very smooth and I have the opportunity to work with professional team and I am sure that I will contact Compass again in the future for other software development services. 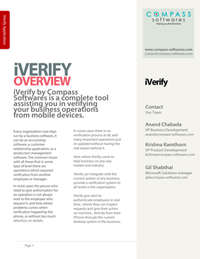 Click on the icon below to download a PDF version of iVerify documentation. Cannot read PDF files , click on the icon below to view iVerify documentation on your browser.